Dead drunk will have to do! Can you hear the castanets? Then how will he survive? With the flick of a shawl. This is loosely based on the film of the same name [director John Huston's 1964 screen adaptation of Tennessee Williams' play] where Richard Burton plays the role of an alcoholic preacher who loses his church because he was seduced by a woman. But he's not defrocked of his clerical collar. He ends up leading a bus tour to Mexico that stops in a funky, rundown place where once again he has to deal with temptation. The song fits in with the theological/ecological theme of the album. I agree Loosagal8, the song Hana does sound like it's describing Hannah Jelkes! Inspired by Joni to watch the movie of Tennessee Williams' play, Night of the Iguana, I have been reading about that play. 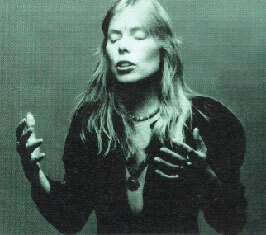 Does anyone who remembers the character of Hannah Jelkes think that Joni's HANA is based on that character? TW says "She is a very, very modest person, Hannah, and in that sense, to me, a very beautiful person......almost as a definition of what I think is most beautifully spiritual in a person and still believable." From an interview with Studs Terkel, 1961.